Ahlstrom Filter Paper (Grade 55) for Soil Lab Testing - Gilson Co.
Ahlstrom Grade 55 Filter Paper is fast-filtering paper for use in triaxial shear strength, flexible-wall permeability and other soil testing procedures to prevent migration of soil fines from samples and blockage of pores in applications where porous stones are used. It is equivalent to Whatman Grade 54 as recommended in a number of ASTM and AASHTO soil test methods to prevent migration of soil fines and blockage of pores in porous stones. This high-purity paper features a high resistance to strong acid and alkali solutions, increased wet strength, and a tough, smooth surface free of loose fibers. It has 15µm retention and a filtration speed of 220ml/min. The circular pre-cut filters are available in a package of 100. 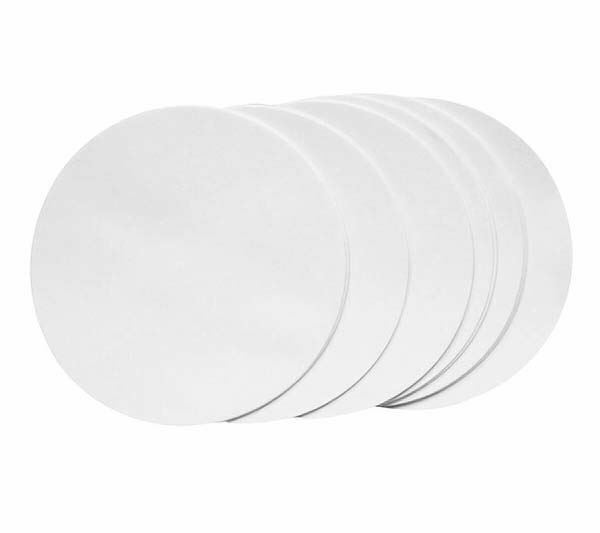 HMA-772 Filter Paper (Grade 55) is used with 2.0in (50.8mm) diameter samples. HMA-773 works with 2.8in (71.1mm) diameter samples. HMA-774 is used in testing 3.0in (76.2mm) diameter samples. HMA-775 used with samples that have a diameter of 4.0in (101.6mm). HMA-776 is for use with 6.0in (152.4mm) diameter samples.